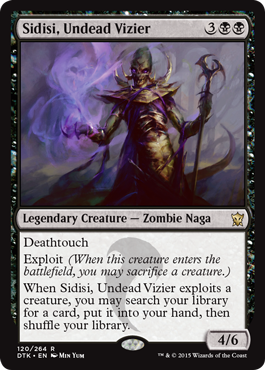 Sidisi, Undead Vizier is one of the best black cards in Dragons of Tarkir. Patrick and Michael go over the ins and outs of Sidisi, Undead Vizier and the Exploit mechanic in general. Sultai Emissary is going to have lots and lots of reasons to raise in value. Damnable Pact, aka “DrainGeyser” is a flexible staple-to-be. Damnable Pact is equally valuable pointed at you or your opponent (depending on the context of a game). Remember: When you point it at yourself, you’re probably not in a lot of danger, and / or you have a bit of cushion in the life points column. It might look little, but Shambling Goblin is standing by to become a strapping shield. Blood-Chin Fanatic is a potential paradigm-changer for the Warriors linear. Patrick calls MichaelJ a genius for his take on Blood Chin Fanatic… But he also calls him a “Gnarled Mass afficionado” (which he is, let’s be honest). Blood-Chin Rager ain’t no slouch itself! 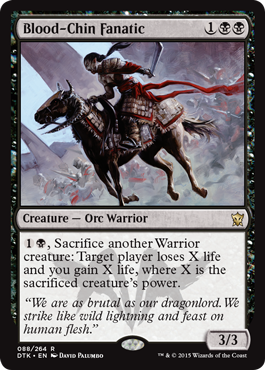 A 2/2 for two mana, Blood-Chin Rager will not be the most exciting Warrior in terms of power-to-casting cost ratio… But it will do good work for Team Warriors. Remember: Cowards Can’t Block Warriors; and with Blood-Chin Rager in the mix, everyone else is going to have a hard time, too. 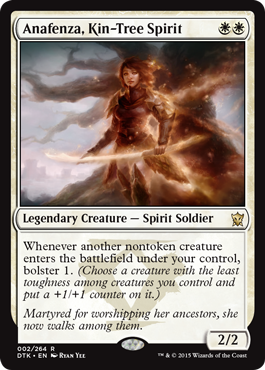 Anafenza, Kin-Tree Spirit is much more than a 2/2 for two itself! 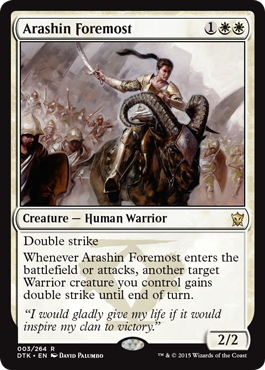 Patrick makes quite the case for this card in “Sidisi, Undead Vizier + the Best of B&W”. Arashin Foremost is a creature packed with potential. Find out why this creature might be even more powerful than the once dominant Silverblade Paladin.